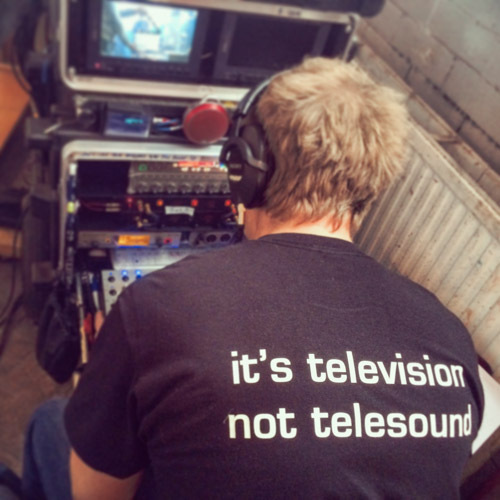 My name is Deian Humphreys and I’m a Production Sound Mixer specialising in television drama and film. 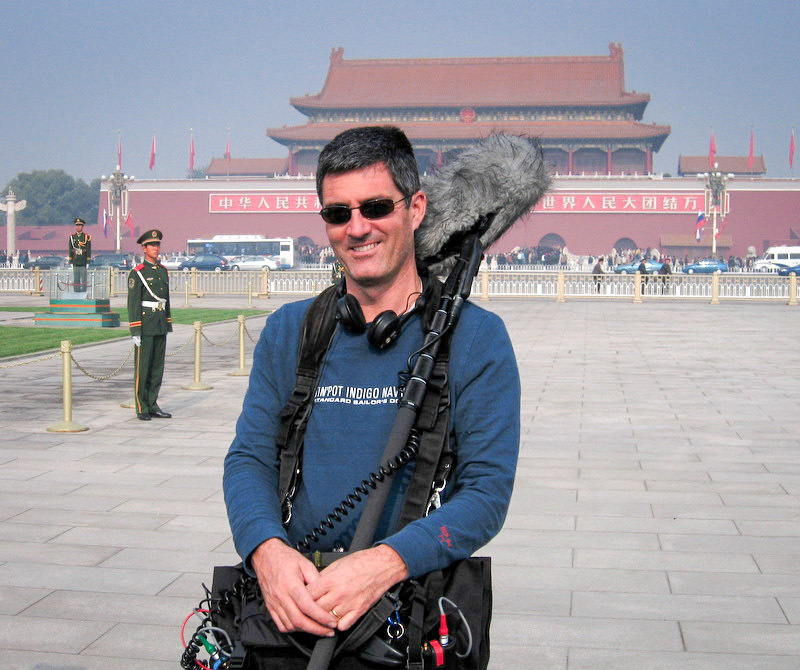 With 22 years experience in professional broadcast sound, I have worked as a sound recordist, a sound supervisor and dubbing mixer. 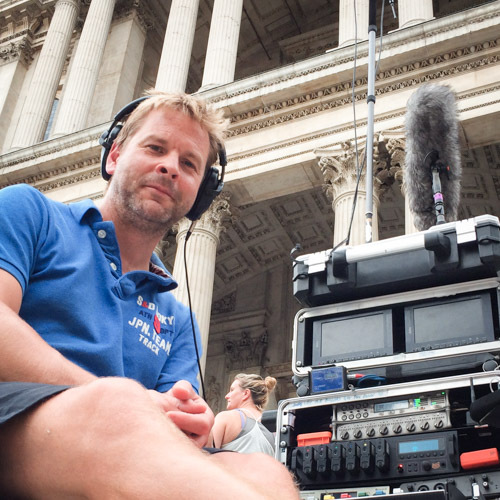 I’m very fortunate to have gained valuable experience working on a variety of programmes – live magazine shows, outside broadcasts and travelling the world as a documentary recordist. These different genres and situations have taught me how to apply various techniques in varied situations – which mics to use, how to mount them, what they should sound like, and ultimately how to get the best results especially when time is of the essence. It was through a friend’s father that I was offered my first job after leaving university, graduating with a degree and MA in music performance. 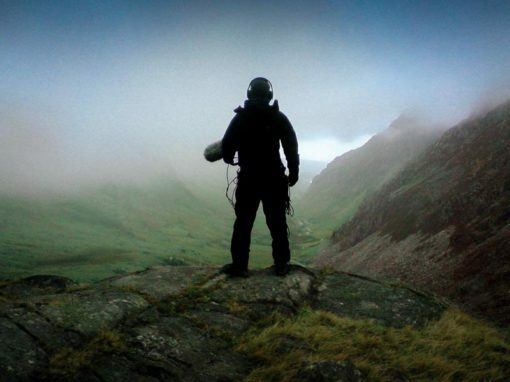 A south Wales based sound recordist, Alan Jones was looking for a trainee boom operator to work on a hospital drama and I jumped at the chance. I was very eager to learn and thankfully Alan was a great teacher. I also studied books on the theory of sound and quickly learnt about technical aspects of sound and microphone characteristics. This was when I learnt how to listen – there cannot be a substitute for holding a mic yourself and hearing how different it sounds depending on where you position it. I then moved on to become a sound assistant on a studio based magazine show. Here I received invaluable training in a broader sense. I learnt how to rig microphones on people, instruments, and all sorts of other things that made noises. 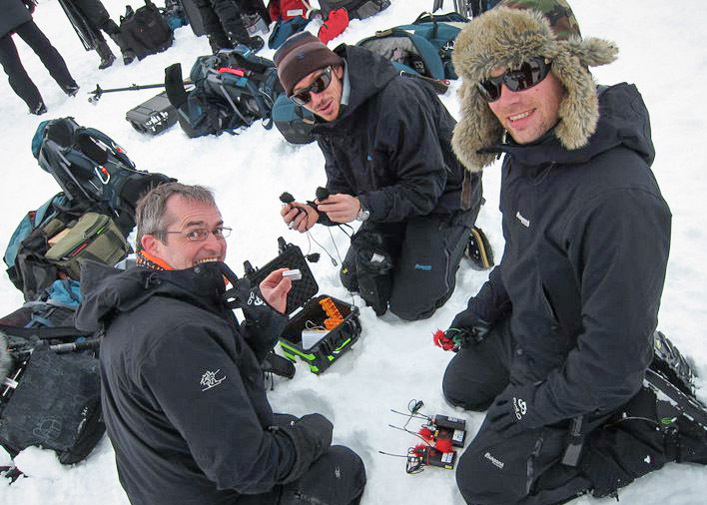 I was taught how to use a PSC kit and was let loose as a recordist. This was when I learnt how to listen – there cannot be a substitute for holding a mic yourself and hearing how different it sounds depending on where you position it. 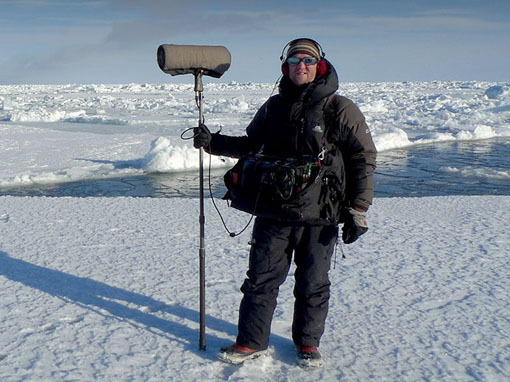 I believe it’s essential to take time to learn where to ‘put’ a mic before, as a recordist, you start telling others. This is true of boom mics but also of lavaliers. Discovering where a personal mic works best hidden in artist’s clothing takes time, practice and patience. I started to take note of different qualities in different equipment – microphones, mixers, and headphones. Using the variety of kit made available to me meant I could, in time, pick and choose what I regarded as my preferred choice when it came to investing. 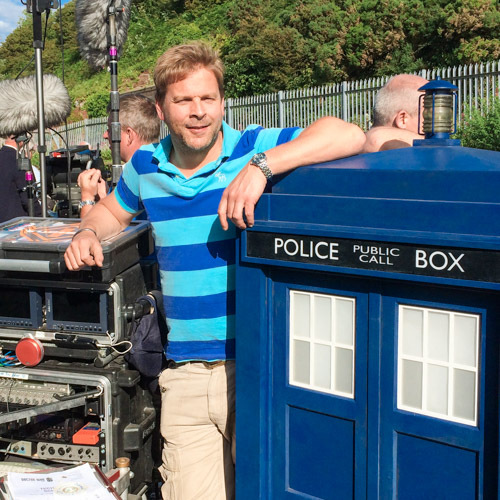 Fast forward to the present day and I am currently working on my third series as the sound recordist on ‘Doctor Who’. 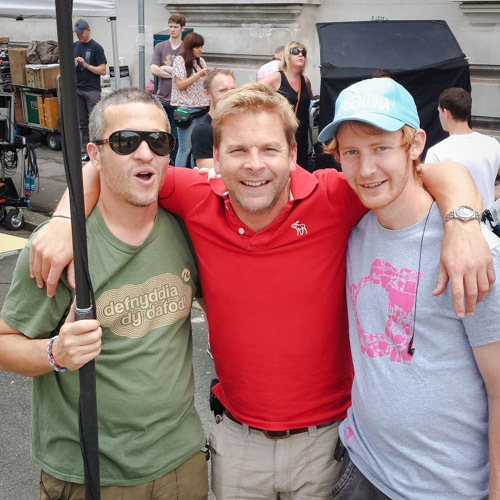 I’m very fortunate to have working with me boom operators Tam Shoring and Chris Goding. 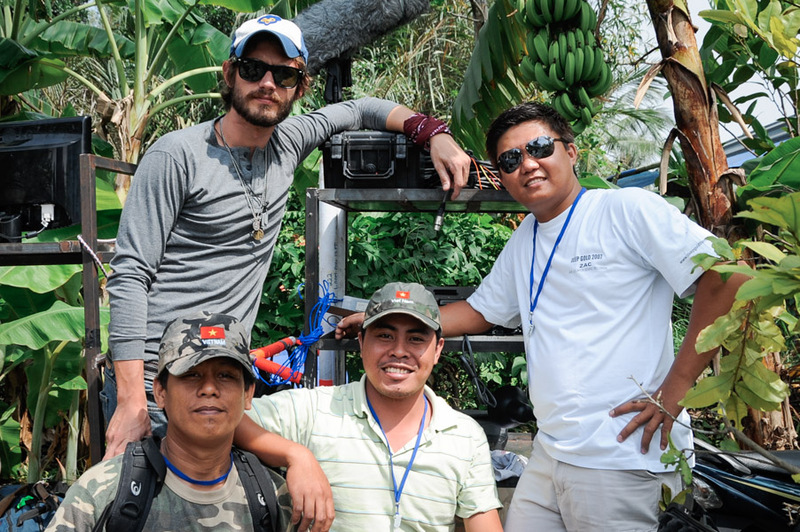 Together we are entrusted with capturing the dialogue as cleanly as possible. With a science fiction show like this, it’s easier said than done! 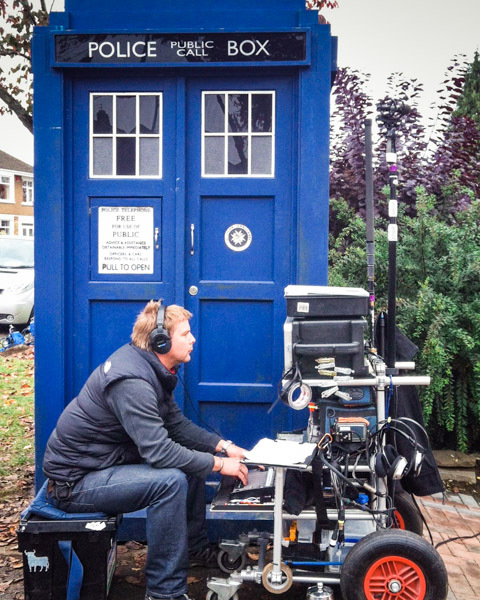 We combine locations with studio work based in Cardiff, and from one episode to the next, as a crew we are taken on a rollercoaster ride through various eras, different planets, and a plethora of monsters. 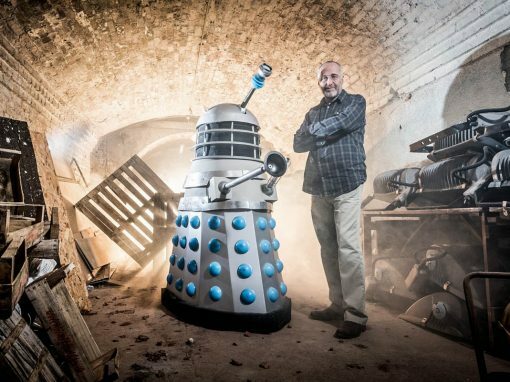 Riding motorcycles through London, dangling from helicopters, running through narrow tunnels, swimming in goop, sword fighting, or standing on a volcano, I need to ensure that my equipment will stand up to all that ‘Doctor Who’ throws our way. My philosophy as a recordist is try and get useable audio on all shots. 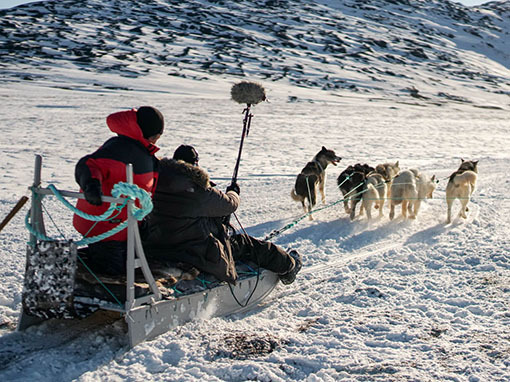 With it being a two camera show, the artists are all rigged on radio mics – using Rycote Stickies and a combination of Undercovers or Overcovers. I have not come across an easier or more effective way of attaching a lavalier – believe me I’ve tried all sorts of different techniques over the years. No fuss, no mess and it’s very quick to achieve the desired outcome. For me, the Overcover provides both wind protection and eliminates clothing rustle. Goodness knows what we used to do before their advent! Even for the wide angles I will create a mix for the edit using the radios. 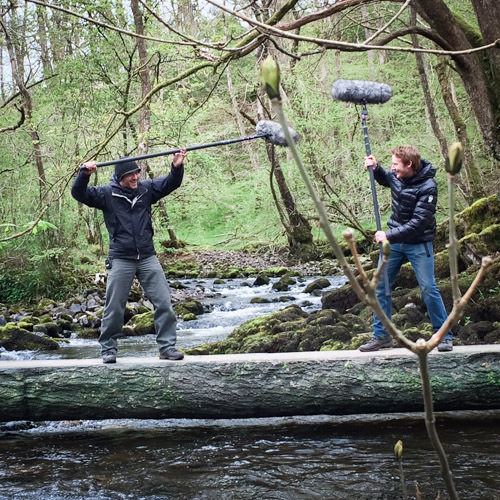 Clean sounding lavaliers are therefore essential – achieved only by using Rycote Stickies and Overcovers. When we get into tighter angles we’ll cover all the dialogue with the booms, wild tracking any lines that aren’t ‘ticked-off’ or that were spoilt in any way by extraneous noises. Again, as it’s science fiction we are constantly at the mercy of the special effects department and it’s a relentless task chasing smoke or steam machines that needn’t be on. 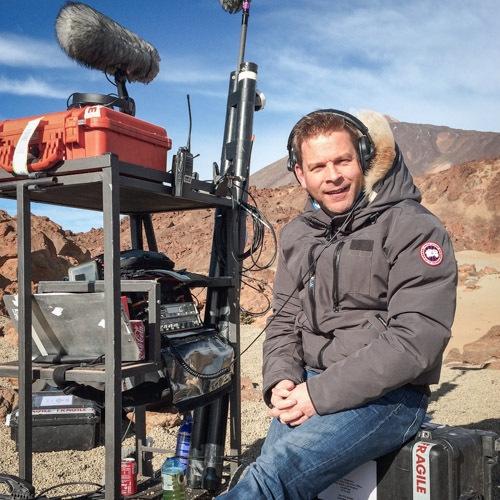 From the outset, when I came to purchase equipment there was no question of how I would mount my boom mics, as I had always been so impressed by Rycote products. It is essential that what is holding a very sensitive mic is as quiet as possible and this is where Rycote products come into their own. Being both sturdy and durable the modular system not only helps to keep a £3,500 microphone safe, it protects it from all manner of weather conditions especially in heavy wind and rain. Properly looked after, years on, they remain as good as new, as leaders in their field, Rycote will always be, without doubt, the choice for me. No-one waits for the sound department. As a team, we know that if we need to change anything, we have to do it quickly. 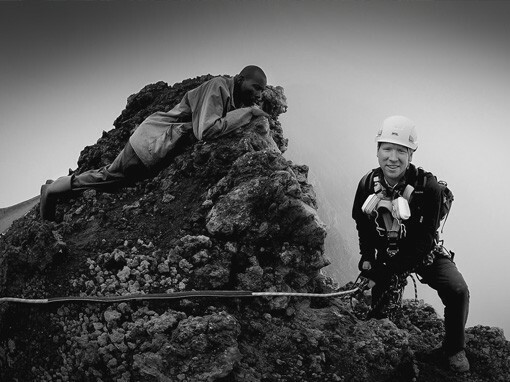 Be it tweaking a radio mic, rigging an extra boom, or laying carpets. You have to know what you want to do and do it quickly – almost being a step-ahead of everybody else. Keeping extra equipment close by is important too as even running to the van takes too much time sometimes. Even for the wide angles I will create a mix for the edit using the radios. 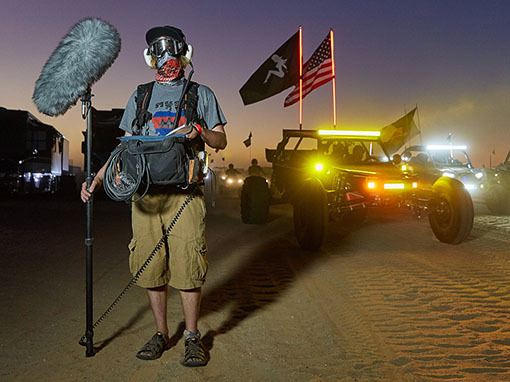 Clean sounding lavaliers are therefore essential – achieved only by using Rycote Stickies and Overcovers. In my experience, one of the things I’ve benefited from the most during a production is a great working relationship with post-production sound. Before a job I will always arrange to meet the dialogue editor and possibly the ADR recordist. This way I know exactly what they would like from my point of view as regards audio and metadata. There shouldn’t be any surprises when they get my audio. 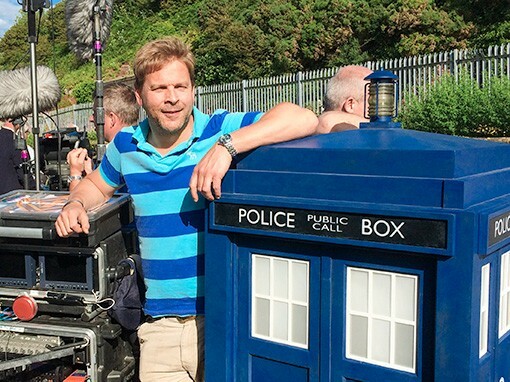 As ‘Doctor Who’ is a relatively long job (nine months in most cases), I can invite dialogue editor Darran Clement and ADR recordist Matthew Cox to the set so that they can see what we do and what we’re up against. It’s always an eye opener for them, plus it gives us a chance to talk about or address anything that needs changing within the workflow. I always stress that if there is anything that they need sound-wise to let me know. Pleasing them is a huge part of my work. I have the easy job. Tam and Chris are the hard-workers. The diplomats. The sound catchers. After watching a block together, Tam will cunningly devise a plan for the booms. 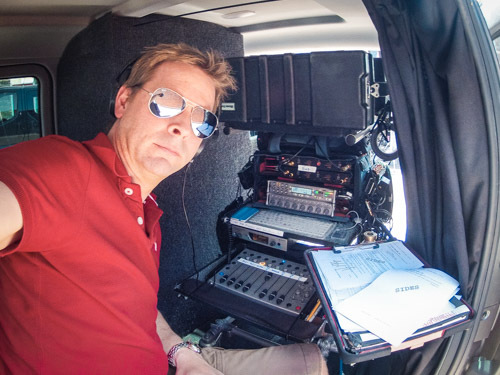 Chris meticulously fits the radio mics on the actors – constantly tweaking if necessary at my command. Both Tam and Chris will then mop up as much dialogue as they can with the booms. I have a policy of covering all off-lines so that the editors have as much coverage as possible. Discussions with Darran (the dialogue editor) reveals that he will often ‘steal’ a word or part of a word from an off-line if the original has been spoilt by a footstep for instance. This is a valuable tool in a recordist’s chest. If a boom can’t cover a particular off line I will often fill in the blanks by using the radio mics. I’m grateful for the piano lessons I took as a child – they pay off especially when I have 8 faders on the go! Sound Devices 788T recorder with CL-8 and CL-9 fader modules. Schoeps Microphones – 2 x Super CMITs, 2 x CMC6xt with MK41 capsules, and 2 x CCM41Lg short mics. 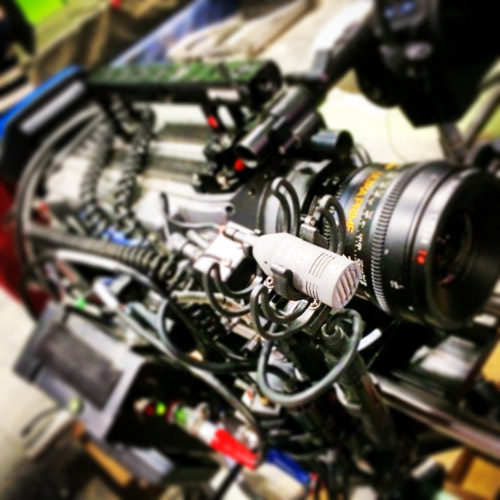 Rycote Modular Lyre Systems with baskets and windshields. Audio Limited 2040 series of radio mics (8 transmitters) with a variety of RK3 and RK6 racks. Into these I plug a mixture of Sanken Cos 11s, DPA 4071s and DaCappo 04 mics. Sennheiser Evolution G3 IEM system for production monitoring. Carry carpets. Lots of good dialogue is often ruined by footsteps. Charm as many members of crew as you can. You never know who you’ll ask a favour of next. Carry chocolate. Nothing like it to persuade a director not to shoot wide and tight at the same time. Look after your equipment and repair anything that breaks straight away. Always buy the best available equipment. It’ll be worth your while in the end. Good headphones. You’ll be wearing them for 10 hours a day. Your team – choose them carefully. 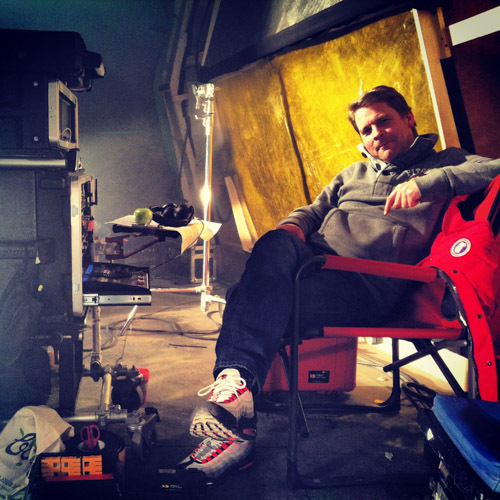 Not only should they be the best at what they do, they should always be people whose company you enjoy and who the rest of the cast and crew like and respect. Have a good working relationship with your post-production sound department. Always carry good coffee and make sure one of your team can make a great Americano!